The 100 Men march - is it helping the situation or not? YOU'RE READING The 100 Men march - is it helping the situation or not? 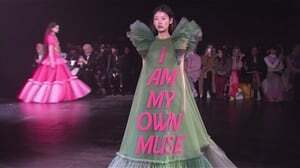 Credit: screenshot from Twitter video. The #100MenMarch is set to create awareness for gender-based violence and people have mixed emotions about it. Gender-based violence (GBV) has been a pandemic within South African boarders and globally. Over the years, in light of horrific cases of women being abused and murdered by the men in their lives, conversations have been held around the issue of GBV and femicide in the country and today the conversation will continue through the 100 Men March. According to the article in News24, the march is set to take place on 10 July 2018 and it will start at Church Square at 10:00 and end on the southern lawns of the Union Buildings by 13:00. "It will draw at least 100 men from various sectors of society, including government, business, labour, faith-based organisations, not-for-profit organisations and the media, to stop the abuse of women and children," explains Phumla Williams, the acting director of the Department of Government Communication and Information Systems. 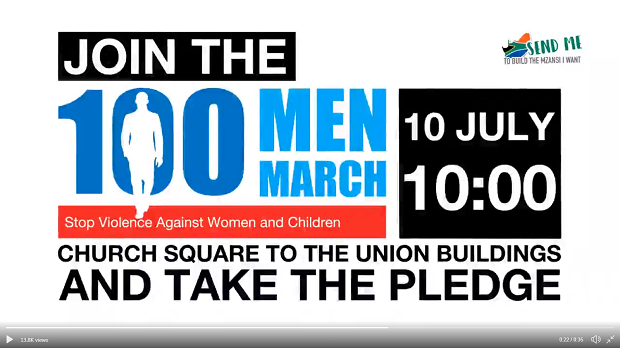 In launching the 100 Men March, Phumla announced that the initiative is to bring men into action against GBV by not only raising awareness of the issues that perpetuate the violence against women and children, but also through collecting pledges from men who vow to assist abuse victims in whatever ways they can. The government has partnered with media personalities to endorse the event, and among the personalities involved is musician Arthur Mafokate, who has been charged for assaulting singer Busisiwe 'Cici' Twala. There are mixed feelings about the march, especially after the revealing of Arthur's involvement. While some people acknowledge that, although it is not what is going to eradicate GBV all at once, it is a good start to dealing with issues regarding abuse; others have expressed their skepticism and lack of confidence in the event and in Arthur's involvement. The activist movement Not In My Name SA (NIMNSA) responded with an announcement stating that they will not be attending the march after hearing that Arthur is expected to be a part of it. We spoke to the secretary general of NIMNSA, Themba Masango to comment on the march and Arthur's involvement in it. READ MORE: When men are abused and raped – why are we not taking it seriously? "NIMNSA agrees with the intention of the march which is being organised tomorrow. We are in full support of the motive of the march to raise awareness around the pandemic of GBV in South Africa [and] we agree that all South Africans should stand up and advocate for the rights of women and children. However, as NIMNSA, we have felt that it is important for us to bring out this fact that we will no longer be supporting the march due to the fact that Arthur Mafokate will be part of this," says Themba. "We were willing to endure the fact that even the government is still harbouring convicted women abusers in their parliament and march together with the government and its officials", Themba explains. "However, Arthur coming out publicly and the communication department in the government not saying anything against Arthur coming to the march regresses the whole struggle. We wish them the best of luck, however we as a movement have taken a stand that we will not be going there". The campaign is one the stems from good intentions, and it is about time that men are pulled into the conversations about the reasons why women and children don't feel safe. The execution of the campaign, on the other hand, is a sensitive matter because of who is involved and what the event generally suggests. READ MORE: Should we be calling Solange an abuser? In the Twitter video that explains what the event is about, the first words that flash on the screen are "not all men", and this is the well-known dismissive response to the #MenAreTrash hashtag. If the narrative is that not all men are part of the problem, the objective will need to be made even more practical than a march and signed pledges; especially considering that injustices that GBV victims still face. The objective of the campaign should not be to create a platform of redemption for abusive men while their victims are still dealing with their physical and emotional scars. Neither should it be meant to keep the conversation going but do nothing practical and effective enough to see to it that South African women feel safer and safer as time goes by. Tomorrow when hundreds and hopefully thousands of South Africans come together to march for GBV awareness, it should be about finding practical ways to keep men accountable for their actions and to move forward in making the safety of South African women an actual priority. We hope that he will recognize the outrage following his publicity on the Sunday Sun and reconsider his participation. The march tomorrow is about a serious issue and we don't need sideshows. On Tuesday all the influential men who have pledged to join the march stay at home and tweet their sins against women and start apologising. Then we have a conversation. I really want to join the #100MenMarch but is it worth it? We just going march in Church Square and then what? Are we having conversations on how to better treat women and deal with misogyny? Is government going to pass harsher punishments for abusers?